Lots of elements come into play when you look at a path or hills in the distance. Paths have shadows along the way that change as the sun rises and sets. Hills in the distance take on a bluish tint, which is called atmospheric perspective. What does that mean for us artists? It means that an accurate rendition of a landscape will have bluish mountains in the distance, or a path will be blue at the top. I’m not suggesting that all landscapes be accurate. I am only mentioning this if you are working on a scene that is meant to approximate a real place and you are using realistic shading. Shadows are another story. Technically speaking, according to Wikipedia, “a shadow is an area where direct light from a light source cannot reach due to obstruction by an object.” The length of the shadow changes during the course of the day. For your landscape, the sun is the light source. The sun’s light is blocked by trees along a path causing their shadows to appear on the path. The length of the shadow is commensurate with the height of the sun. If it is early in the morning, or late in the day, the shadow will be long. If the sun is overhead the shadow will be shorter because it is cast directly underneath the trees. The shadow takes the shape of the tree that is blocking the light. I wrote this up as much for you as for me. I find it a challenge to get these elements “right” in my work. I figured it would help to write it all down. In my latest piece I played with both atmospheric perspective and shadowing. Here’s a closeup of the path. It’s vague, but it’s there. What do you think? Can you tell what I tried to do? Should I do more? 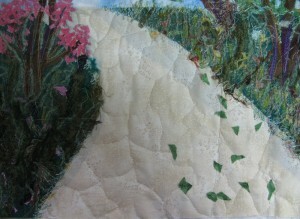 Thank you for sharing I am beginning to explore more landscape quilts. In our local land scape is very flat and I am spending a lot of time looking at how the trees could give the feeling of depth in a landscape and how the give the viewer information about minor changes in gradient. If the trees in a row grow smaller as they get farther away, that shows depth. You have to follow the line that ends in a vantage point. If mountains in the backdrop are gray and misty-looking, that helps them look far away.